The continent of Africa has 54 countries in total according to the United Nations, including recognized states and territories. However, there are some disputed territories that could change the number of countries. Africa is the world’s second most populated and second largest continent. It is also home to a wide variety of countries. The exact number of countries in Africa varies depending on who you talk to, with there being anywhere between 47 to 55 countries on the continent. Officially, the United Nations recognizes 54 different countries. Meanwhile, the African Union recognizes 55. Why does the number of countries in Africa vary so much? Before diving too far into why the number of countries in Africa fluctuates, let’s take a good look at the countries that are typically recognized as existing on the African continent. Africa is home to a vast array of countries, from massive countries amongst the most populated in the world to countries with some of the smallest populations. 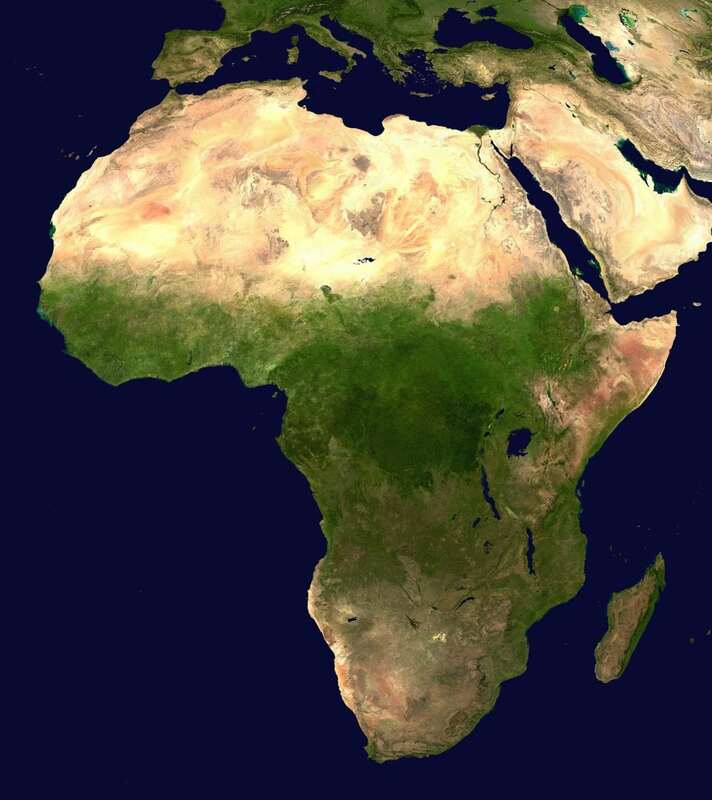 The five largest countries in Africa are Nigeria, Ethiopia, Egypt, The Democratic Republic of the Congo, and South Africa. The largest country in Africa, in terms of population, in Nigeria. Nigeria is roughly in the middle of Africa on the Atlantic coast and is home to around 186 million people. Ethiopia is the second largest country in Africa, home to around 104 million people, followed by Egypt whose population is approximately 95 million people. The Democratic Republic of the Congo is home to around 78 million, and rounding out the five largest countries in Africa is South Africa, which has a population of about 55 million. At the opposite end of the scale, Africa is home to some very small countries, including Djibouti, Comoros, Cape Verde, São Tomé and Príncipe, and the Seychelles. Djibouti has a population of about 865,000 people, while Comoros has a population of around 807,000. Cape Verge is home to around 492,000 people. São Tomé and Príncipe is the second smallest country in Africa with a population of 179,200 people and the Seychelles is home to just 90,000 people. The reason the number of countries in Africa varies is due to disputes and inconsistencies surrounding several nations, with several islands off the coast of Africa being of disputed national status. An example of a nation with disputed recognition is Somaliland. The government of Somaliland declared independence from Somalia in 1991, and have governed territory from the capital of Hargeisa since then. The Oxford English Dictionary defines a country as “a nation with its own government, occupying a particular territory”. If this definition was used, Somaliland would be its own country. The United Nations recognizes Somaliland as a de jure autonomous region inside of Somalia. Yet many of its neighboring countries and many in Somalia still do not recognize it as a country. Somaliland shares its disputed recognition with other regions like Western Sahara. Western Sahara is a region that is approximately the size of Colorado, located on the Atlantic coast of North Africa, and bordered by Mauritania, Algeria, and Morocco. The country was colonized by Spain in the late 19th century and was a part of the greater Spanish kingdom for over 100 years. Western Sahara is home to around 570,000 people and sits upon rich deposits of iron ore, phosphate, and possibly offshore oil deposits. Though it may seem unusual to not be able to say for sure how many countries exist on a continent, the phenomena isn’t actually that rare. Disputes over borders and national sovereignty/recognition are also happening in Asia. There are long-standing disagreements about if Taiwan can be considered its own nation, ever since it separated from China in 1949. The Taiwanese government has been worried about political retaliation from Beijing if it seeks to declare its independence, so it has not officially done so. Despite this, Taiwan governs itself and has its own currency, making it pretty much its own country. Europe is also home to sovereignty disputes. Serbia does not recognize Kosovo as its own independent nation, even though most other countries in Europe do. Many of these disputes can be traced back to the colonial era, with countries and populations that existed for many years under the rule of a colonial government just now seeing independence. As it stands Africa is still home to dependent territories belonging to France and Great Britain, including Mayotte and Saint Helena. In the final quarter of the 19th century, the European powers drew up their own maps and divided regions into countries as they saw fit. Even as decolonization occurred, the borders of countries shifted back and forth. Libya kicked off the decolonization trend in 1951, and during the 50’s and 60’s many other countries would gain their independence. 1958 saw the large region of French West Africa become around 8 different countries, including what is now Mali, Guinea, and Niger. Most of the remaining countries of Africa would gain their independence sometime during the 1960’s. The independence of Namibia in 1990 would mark the tail end of decolonization, though in 1993 Eritrea broke off from Ethiopia to establish its own independence. The effect of this sudden political upheaval created by colonization was that native populations and regions were forced to live in countries created by imperial powers. As a result, power dynamics and governments were formed without much regard to the wishes of those who lived there, and the ensuing struggle for independence by various groups and populations has contributed to the disputes over sovereignty and international recognition.